PADI Deep Diver Certification. Price includes fees for instruction, physical manual and certification only. Does not include cost of dive trips. Class & 4 Training dives required. PADI Deep Diver Certification. Price includes fees for instruction, physical manual and certification only. Does not include cost of boat dive trips. Class & 4 Training dives required. The lure of the deep. There’s something exciting and mysterious about exploring deeper dive sites while scuba diving in the Cayman Islands. Sometimes it’s a wreck that attracts you below 18 metres/60 feet, and on wall dives it may be a giant fan or sponge. Whatever it is, to scuba dive with confidence at depths down to 40 metres/130 feet, you should take the PADI Deep Diver Specialty course. Instruction, certification, classroom lesson, PADI Deep Diver manual, air tanks, belts, lead weights, dive light, towels and drinking water. Cost of boat dives, Nitrox, rental gear (BCD, Regs, Wetsuit), Dive Computer. eLearning is not available for this specialty certification class. 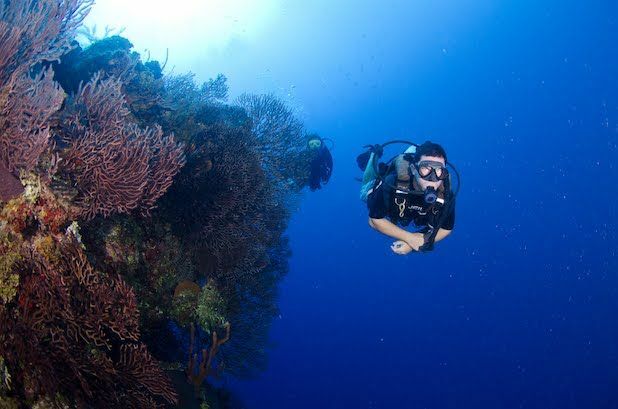 Book your dives with Ocean Frontiers and then 'Add-On' this specialty class. You can add it on via the shopping cart online, call or email to complete your reservation and enrolment. A PADI Deep Diver Crew-Pak is included with a manual and a DVD. Read the manual and watch the video before startting the class.